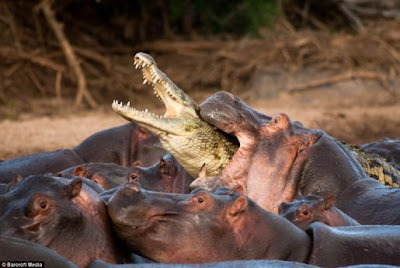 Confrontations between hippos and crocodiles aren't a rare occurrence. Crocs want to eat young hippos, and the herd wants to stop that from happening. In once such recent event in Tanzania, a crocodile was being faced down by the herd when they found him creeping up on their young ones. In a bid to escape the more aggressive members of the herd, he tried to scamper along the back of the hippos in his own real-world version of Hungry Hungry Hippos. It didn't end so well for the crocodile. Thanks for the link, Ida. I never thought it'd be a good idea to scramble across the backs of hippos. Now I know for sure. I can hear the croc yelling "Gah!" in the second photo. now that's the first time I felt sorry for a crocodile...! oh wow...brings a whole new meaning to the whole crowd surfing concept! I'm NOT sorry for the croc! Hungry Hungry Hippos are one of my favorites!!! Croc FAIL. 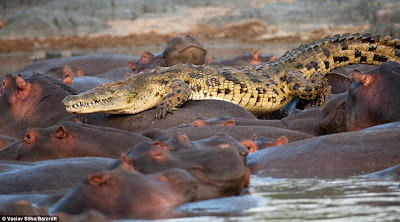 Hippos kill more people in Africa than all other animals there COMBINED! Croc should have done his homework before pulling that stunt. I could just see the croc standing on the bank yelling to his friends, "Hey guys, watch this!" We all know what comes after that statement. Hippos are kind of scary. I always thought they were these cute chubsters and apparently they're really aggressive. Very cool. Not something you get to see every day... or even hear about. I do feel a little bad about the croc, but well... thats what it gets for trying to go after the momma and baby. Haha, I agree with Phoebe! I can definitely imagine the Croc giving out his final death cry. The link that has all the images... I couldn't help but think "Animated gif". But wow... epic fail croc. Animal behavior is truly amazing. Their day to day lives are fascinating: from bugs to elephants. Thanks for sharing this it's not something I'm going to see by studying my aquariums and flower gardens daily! i stayed with my bro in kenya his a scientist and had a house in the middle of nowhere. the house had no doors to the living room. it was next to one of the smaller branches of the nile. and every nite id lie awake cos a hippo would run in circles around the garden and the whole house would rock and move as he ran. sometimes hed come into the living room, at those times it was just keeop in the bedroom and hope he'd go. The Croc got what he had coming. The herd told him to piss off! The croc didn't. It messed with their young and I'm glad he was munched. Survival of the fittest. He wasn't on this particular ocassion. Great blog!